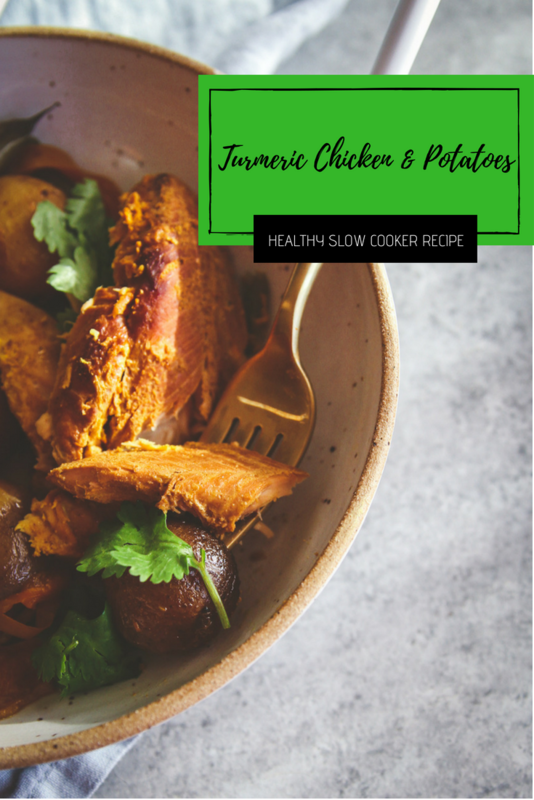 This healthy crockpot (slow cooker) turmeric chicken and potatoes is one of my favorite recipes to make. 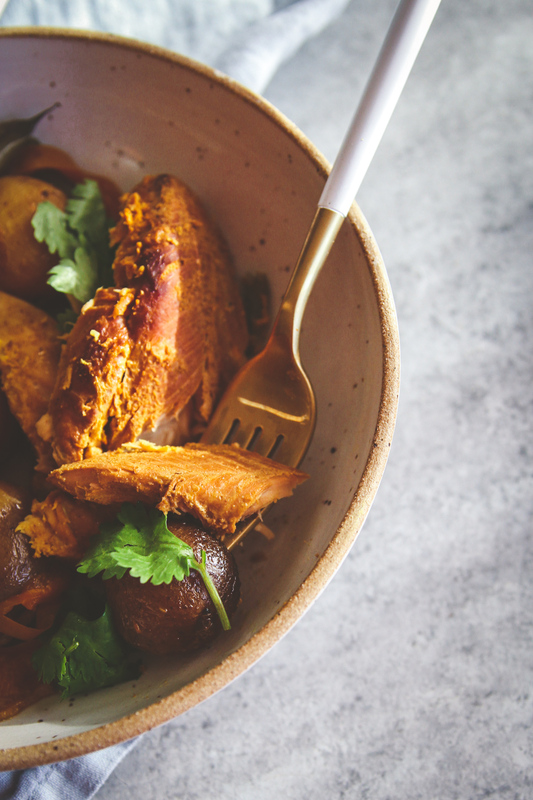 It’s super healthy and has so many amazing health benefits because of the turmeric. 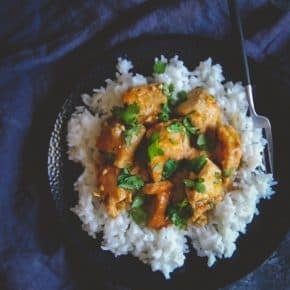 This turmeric chicken dinner recipe can be made ahead and just put in the crockpot when you’re ready and then ‘set and forget’, and my whole family (including my baby) love with this dish. I don’t know about you, but lately, I have seen turmeric everywhere. It’s like it’s the year turmeric. While I’m not quite ready to drink a turmeric latte, I have been using the spice for years. And have known about it for years for its medicinal qualities. During the day, I help run a dietary supplement company (True Botanica) and one of our amazing products is actually a turmeric product called Curcumin Plus (curcumin is the active ingredient of turmeric, known for its anti-inflammatory properties). What are some turmeric benefits? There are literally tens of thousands of articles saying how amazing turmeric is. 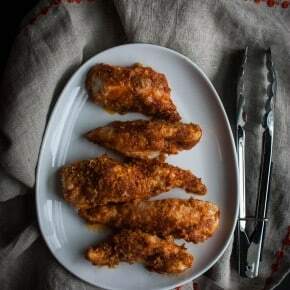 Since this is a recipe post, I’ll get back to describing how to make a meal with turmeric. 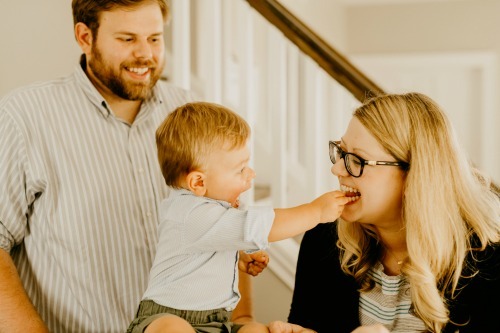 Since I’m at work during the day, I typically don’t have long to make dinner in the evenings, because I want to spend that time with my husband and baby. So what I like to do is either make something ahead that I can just reheat (like this make ahead quiche recipe) or prep something that I can then just put into the crockpot the next day. 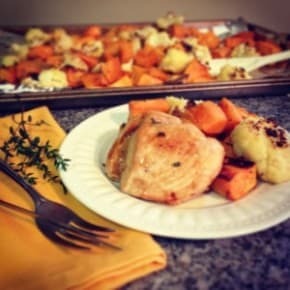 That is exactly what I do with this healthy turmeric chicken and potatoes recipe. 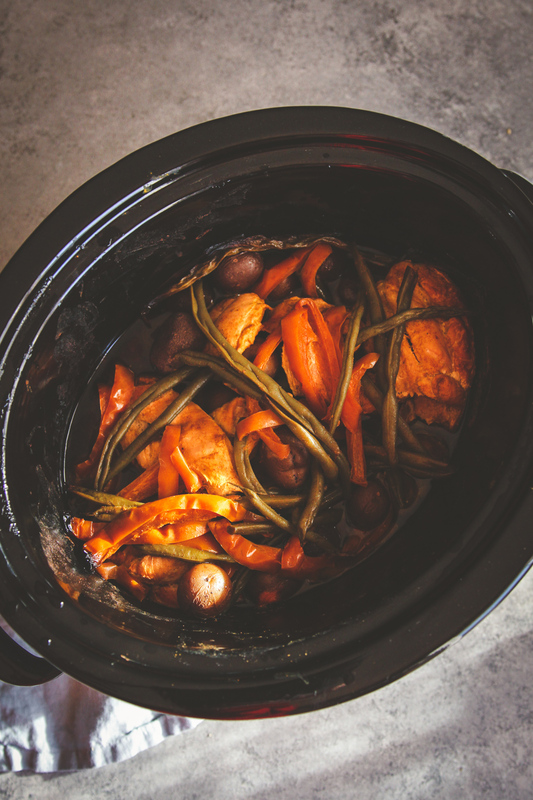 I prep it the night before and then let it marinate in the fridge and then the next day or a few days later (the chicken and vegetables can sit in the marinade for a few days, it builds flavor) I just empty the contents of the bag into a slow cooker on my way out the door, and then come home to a delicious meal. My son loved this dish. He literally steals the potatoes off my plate when we eat this. And if I’m feeding it to him with other things, he will push aside the other things on his tray and go straight for the turmeric potato pieces! 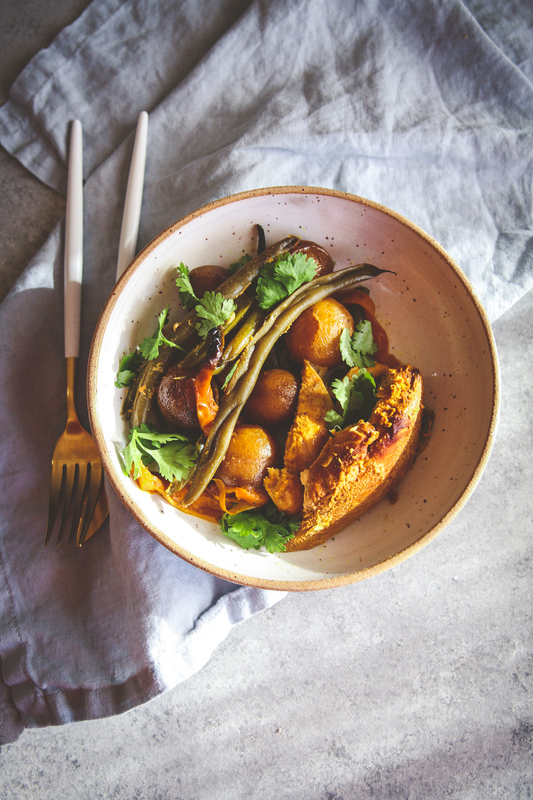 Next time you’re in the mood for a delicious easy healthy slow cooker chicken recipe, look no further than this turmeric chicken vegetables and potatoes! 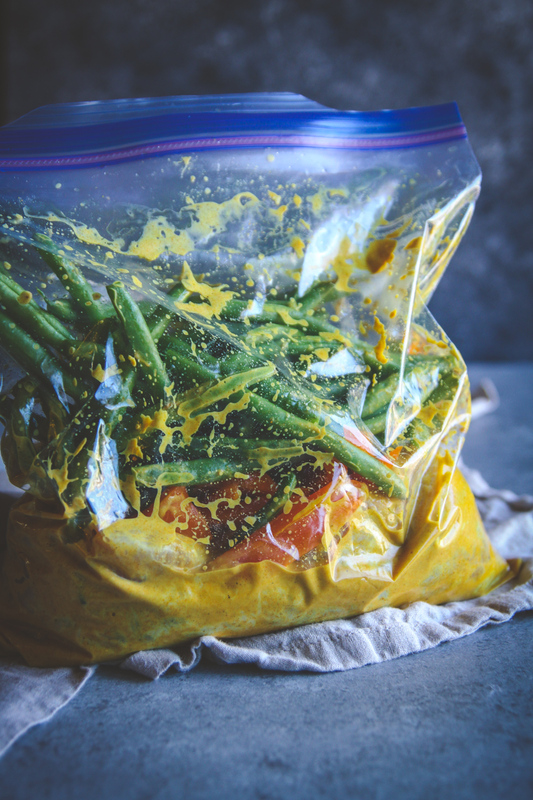 In a gallon ziploc bag add yogurt, olive oil, lemon juice, turmeric, garlic salt, and curry powder, stir inside the bag or massage with hands to mix. Then add in chicken breasts, bell pepper, and green beans. Seal the bag and shake it around so that the marinade covers the contents of the bag. 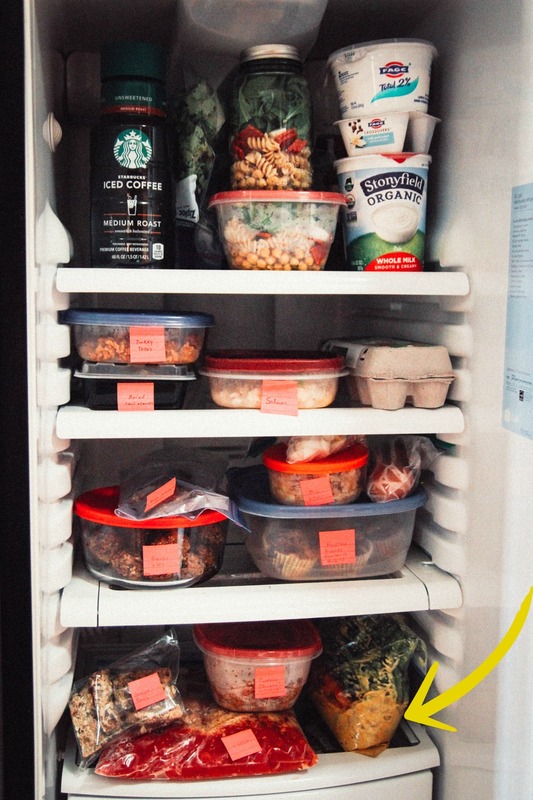 Refrigerate for 2 hours or up to 72 hours. 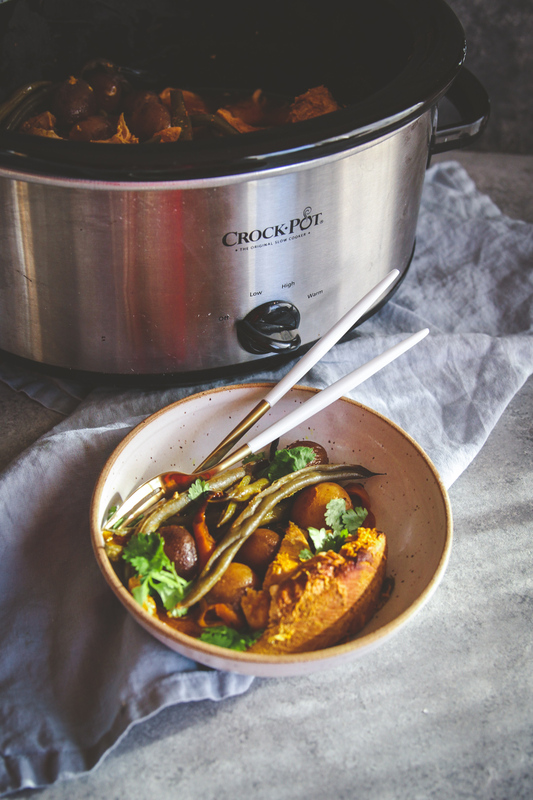 When ready to cook, pour contents of the bag into a slow cooker/crockpot and add a pound of baby potatoes, stir once or twice, set on low for 6 hours or 3 hours on high.